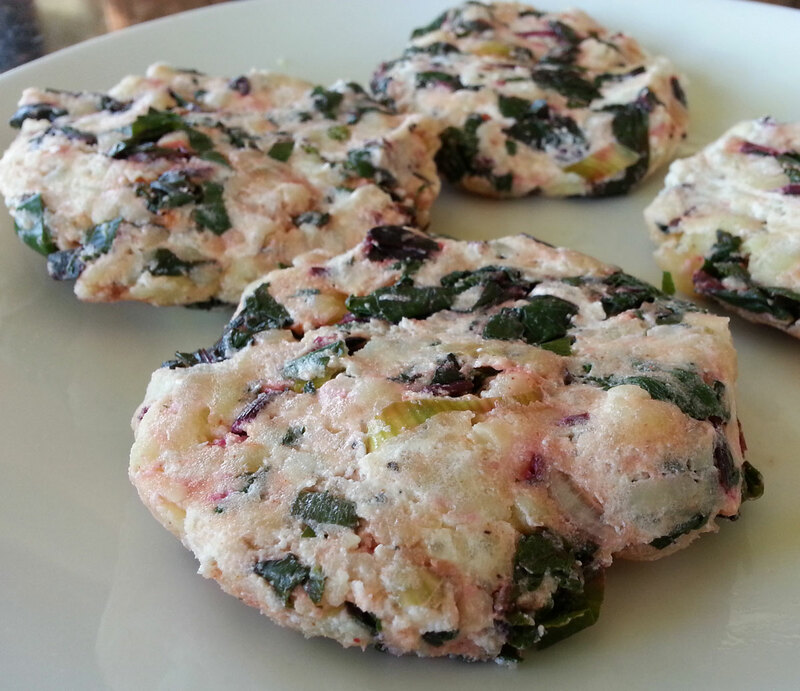 These colorful potato patties are reminiscent of panfried gnocchi with lots of greens and cheese added. Much easier to shape than gnocchi, and completely flour-free, they are an ideal side dish to meat or poultry, or a satisfying appetizer served atop arugula dressed with lemon juice and olive oil or, as in the picture below, shredded green cabbage cooked with mustard seeds and garlic until browned at the edges and limp. Feel free to use spinach or beet greens or Tuscan kale instead of the Swiss chard, and to swap out goat cheese for the Feta, or Pecorino for the Parmigiano; you really can’t go wrong with potatoes, greens, and cheese cooked in a bit of olive oil until golden on the outside and creamy on the inside! Place the potatoes in a saucepan. Cover with cool water and bring to a boil. Reduce the heat and cook until just tender when pierced with a knife, about 20 minutes. Reserve the cooking water, but remove the potatoes from the saucepan, drain, and cool. Peel the potatoes and place in a bowl. Crush with a fork, leaving some small chunks for a more interesting texture. Stir in the Ricotta, Feta, and Parmigiano. Season with 1/2 teaspoon of the salt and all the pepper. Set aside. Return the potato cooking water to a boil. 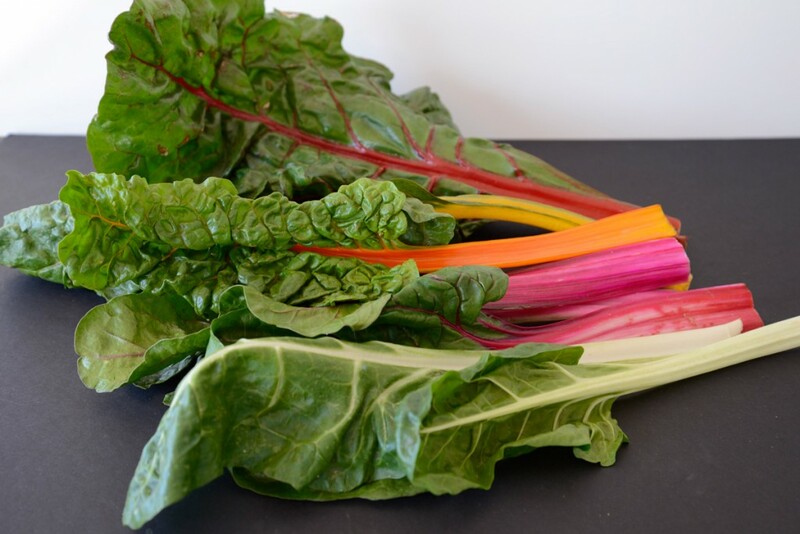 Remove the stems from the Swiss chard (reserve it for another use; I love the stems boiled, then tossed with lemon juice, olive oil, salt, and pepper). 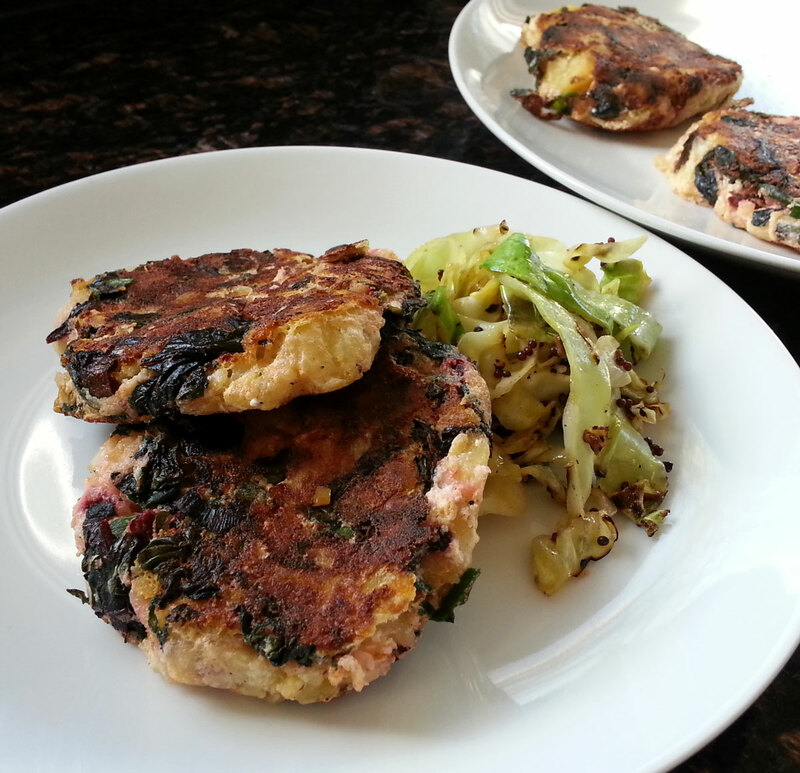 Drop in the Swiss chard leaves and cook 3 minutes, or until floppy. Drain, cool, and squeeze dry. Chop the leaves finely. Place 1 teaspoon of the olive oil in a 12-inch nonstick skillet. Add the chili flakes, scallions, and garlic. Cook over medium heat until the scallions are soft, about 3 minutes. Add the Swiss chard leaves and cook until they are wilted and aromatic, about 5 minutes. Season with the remaining 1/4 teaspoon of salt. Stir into the potato mixture and allow to cool thoroughly. 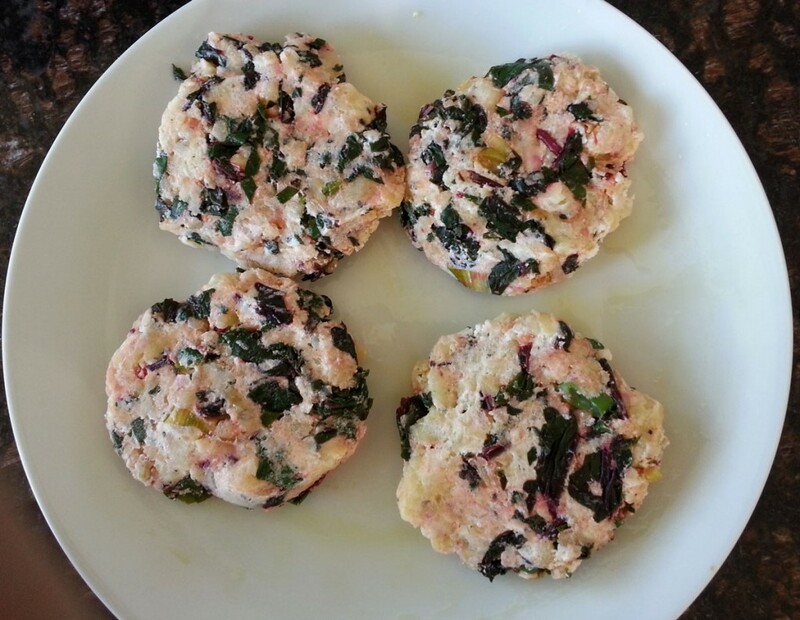 Compact the mixture with your hands and shape into 4 patties, each about 1 -inch thick. Wipe out the nonstick skillet. Place it on medium heat. Brush it with 1 teaspoon of the olive oil. Place the potato patties in the skillet and cook until golden and crisp on the bottom, about 5 minutes. Brush the tops of the potato patties with the remaining teaspoon of olive oil. Flip the potato patties carefully. Cook until the other side is also golden and crisp, about 5 more minutes. Serve hot. Summer is corn season. We eat corn almost daily, usually just boiling it for 3 minutes, scraping it off the cob and savoring it plain, sprinkled with sea salt. But there are times I’ll hunger for corn soup or chowder, and times when a corn fritter beckons. Today was one of those days. 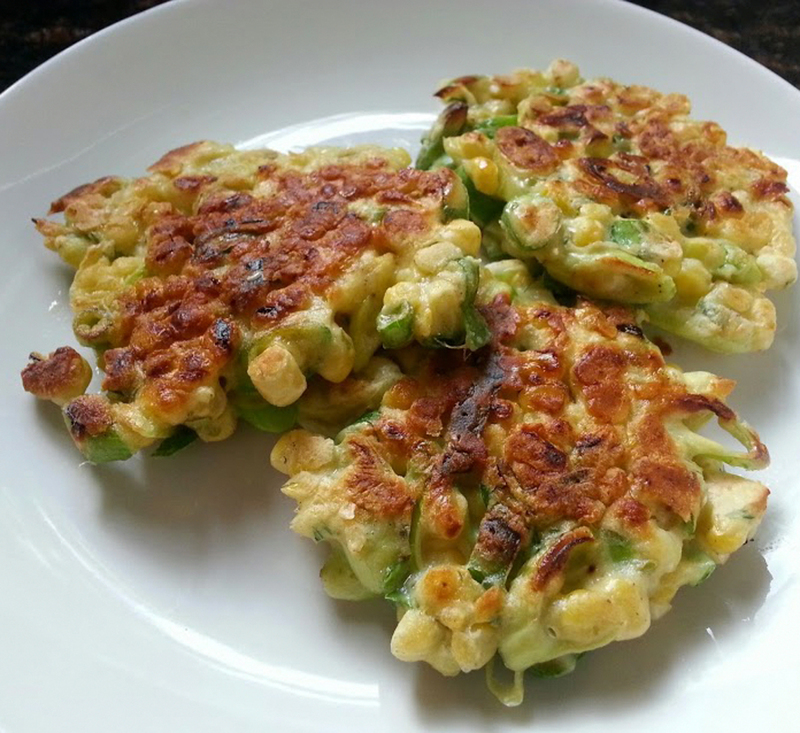 Almost anything is delicious in a fritter: boiled or raw vegetables; cooked grains; bits of savory meat; cheese and herbs… all benefit from a quick jump in a hot skillet with olive oil. 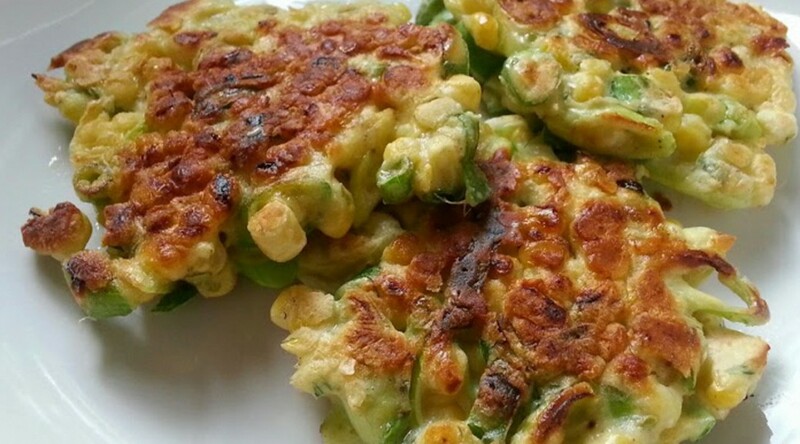 But corn fritters are somehow even more addictive, perhaps because of corn’s natural juiciness and sweetness. Serve these fritters as a side to meat or fish, or with a lovely green salad as a starter. If you happen to be entertaining, they make perfect finger food as long as you make them no more than silver dollar-size. Place the egg in a large bowl. Gradually whisk in the flour, beating vigorously with a whisk until the mixture is perfectly smooth. Add the salt, pepper, cayenne, and thyme, and whisk again. Add the scraped corn kernels and scallions, and stir with a rubber spatula to incorporate. Set aside for no more than 10 minutes (if the batter rests too long, the corn may exude moisture and result in watery fritters). To cook: Heat a 12-inch nonstick skillet over a medium-high flame for 2 minutes, or until quite hot but not smoking. Brush with half of the olive oil. Spoon in the batter, making 6 equal-sized fritters, spacing the fritters about 2 inches apart. Cook for 3 minutes, or until golden brown on the bottom. Brush the tops with the remaining tablespoon of olive oil and flip. Cook until the second side is also golden brown, about 2 minutes more. Remove to a plate. To serve: While the fritters are cooking, toss the greens with the salt and pepper in a large bowl. Add the lemon juice and then the olive oil. Toss to combine. Adjust the seasoning if needed. Pile onto 2 plates. 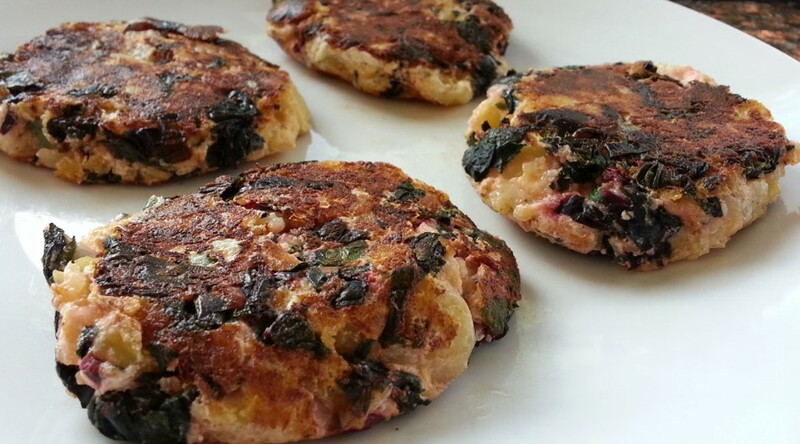 Top with the fritters and serve at once, before the fritters cool down and the greens wilt. 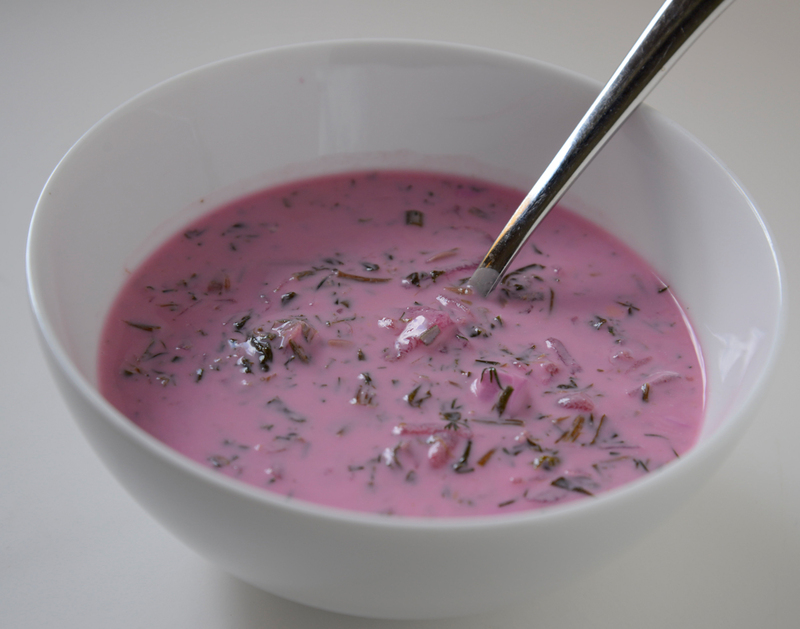 Our friend Grazina brought us a container of this shockingly pink soup two weeks ago, on a particularly hot day. It looked like nothing I had ever eaten before, and at first my husband and I could not quite figure out what was in it, other than beets and dairy and dill. 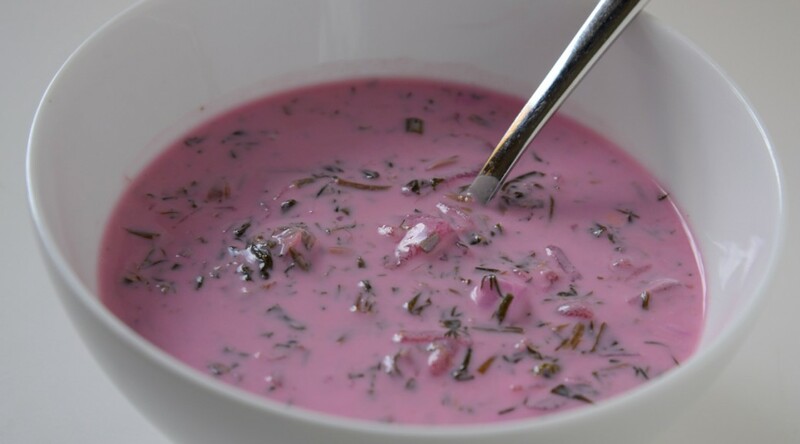 This soup, known in Grazina’s Lithuanian family as “Pink Soup”, is a chilled borscht of sorts. I grew up eating borscht (my Romanian Jewish grandmother made it often) and never really liked it. This soup tasted nothing like the borscht I knew. It is brightly flavored, herbal, and so refreshing. While the ingredient list looks daunting, the actual process is quick and easy: roast some beets; boil some eggs and beet greens (though Grazina uses spinach, and you can too); crush scallions with dill and salt; toss all of the above with buttermilk, sour cream, lemon juice, cucumbers; and enjoy the next day, after the flavors have had a chance to mingle and develop fully. 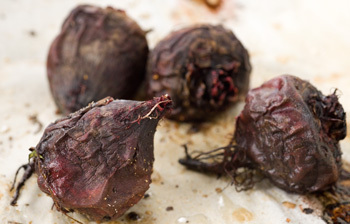 Make the beets: Preheat the oven to 325 degrees. Place the beets on a roasting pan and toss with the salt and pepper. Roast in the preheated oven until tender when pierced with a knife, about 2 hours. 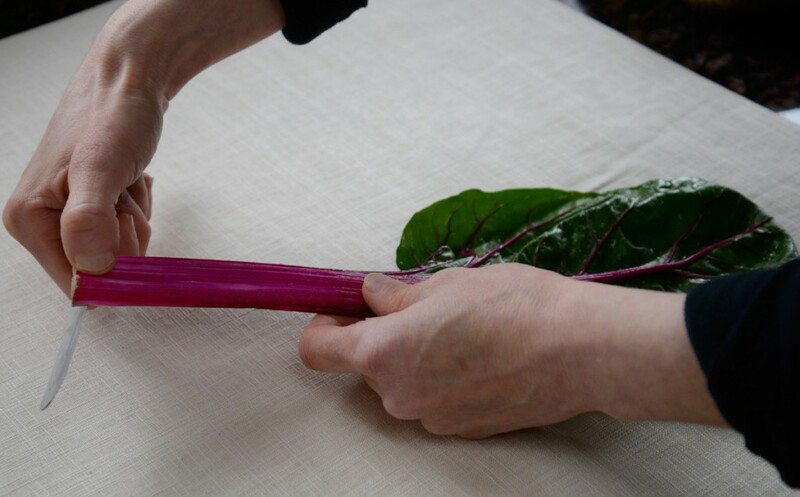 Larger beets may take longer. Cool to room temperature, then peel and cut into ¼-inch dice. Make the soup: Place the eggs in a small pot. Add cool water to cover. Bring to a boil and shut off the heat. Cover with a tight-fitting lid. Let rest 13 minutes to cook through, then drain and cool. Shell and cut into ¼-inch dice. Place 2 cups of water in the same (empty) pot. Return to a boil. Add the beet greens and boil 3 minutes, or until tender and silky. Drain and rinse under cool water to stop the cooking. Squeeze gently dry. In a mortar, place the scallions, dill, and salt. Crush with a pestle until the scallions and dill release their juice; they will still be chunky, not pasty. Place the scallion mixture in a large container. Add the cucumbers, lemon juice, buttermilk, sour cream, cooked beet greens, roasted beets, and hard-boiled eggs. Mix well. Taste for seasoning and adjust as needed. Cover the container and chill overnight. Adjust the seasoning if needed and serve very cold. The flavor should be slightly tart and sweet, and quite savory; if the soup tastes flat, add a drop more lemon juice and some salt until the flavors brighten. 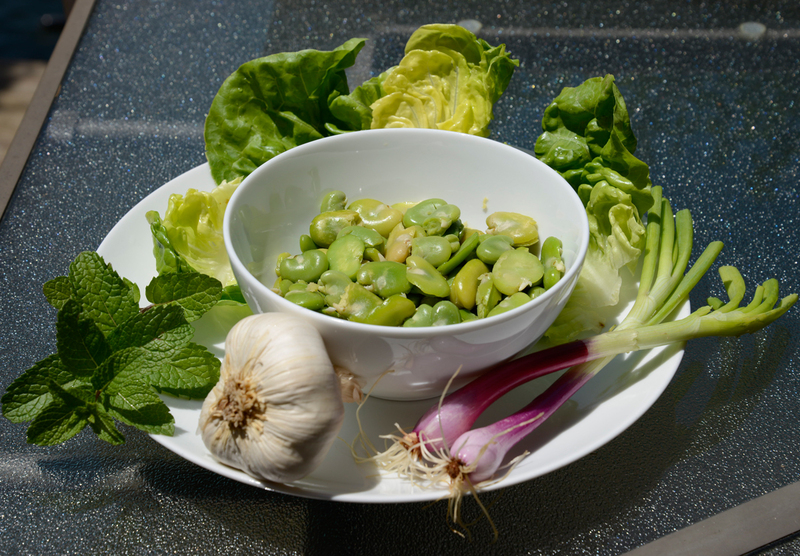 Have you ever tasted fresh fava beans? They are nothing like their frozen counterparts, which are usually mealy and not very sweet. And they are nothing like dried fava beans, which, although delicious and earthy in flavor, are neither vibrant in color (they turn a delicate yellow-ochre when dried) nor flavor (they mellow and become far more “beany” when dried). This is the season to taste fresh fava beans, and my husband and I have been gorging on them since April. We love them plain, boiled briefly and seasoned with olive oil, salt, and pepper; sautéed with bacon and onions as a simple sauce for pasta; transformed into a soothing, creamy soup with a sprinkling of dill upon serving; or, as below, slow-cooked with scallions, mint, and lettuce. The latter is a technique you can also use with fresh shucked peas, which are just coming into season. 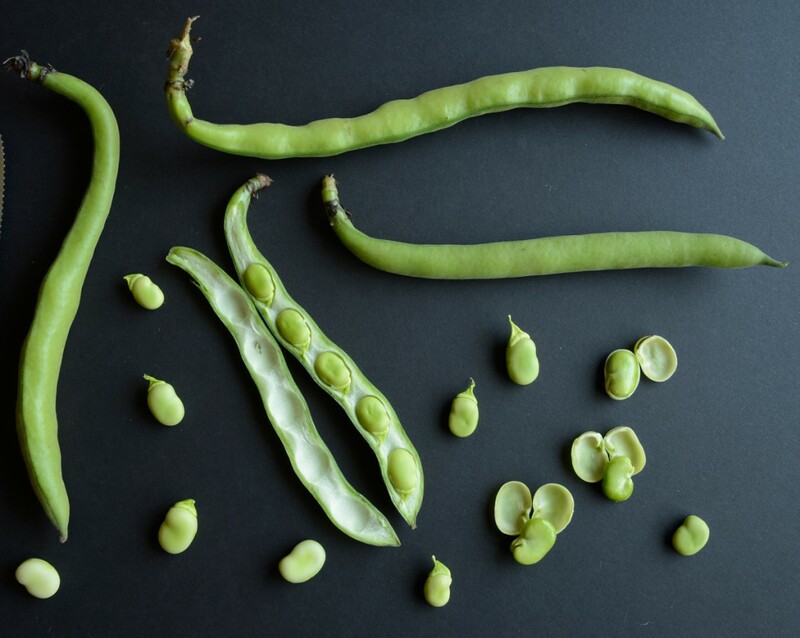 Look for fresh fava beans with unblemished, stiff, heavy pods. The brighter colored pods indicate sweeter beans. Try to buy them the day you plan to cook them, as they will be even sweeter if they never see the inside of the refrigerator. 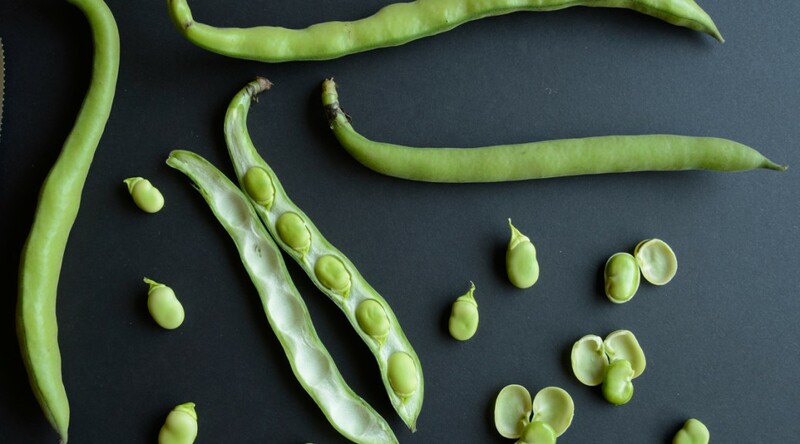 If you are feeling particularly industrious, you can shell, boil, and shuck fava beans in large quantities for freezing; place in freezer-safe plastic bags and freeze for up to 1 year, and your frozen fava beans are sure to be endlessly better than store-bought frozen fava beans. Shell the beans and rinse them thoroughly. Bring 2 quarts of water to a boil and add 1 tablespoon of the salt. Boil the beans for 3 minutes, or until they look wrinkly and have softened a bit. Don’t be alarmed if the boiling water looks a bit dark, as this is completely normal. Drain and rinse under cool running water to stop the cooking, then drain again. Slip off the thick papery skin from each bean (this is shucking, and is necessary for the beans to be edible, as the skins are very fibrous). Place the olive oil, scallions, and garlic in a 10-inch sauté pan. Warm over medium heat until the scallions soften, about 5 minutes, stirring as needed. Stir in the shucked fava beans, pour in 1/2 cup of water, and cover. Cook over medium heat 10 minutes, stirring once in a while and adding a bit of water as needed to maintain a bit of moisture in the pan. The fava beans should never dry out completely. If the beans are still crunchy, cook a little longer, covered; they should be crisp-tender, not hard, when done. Uncover the pan and stir in the remaining 1/2 teaspoon of salt and the pepper. Add the mint and lettuce, stir well, and cook 1 minute, or until the lettuce wilts. Taste for seasoning and adjust as needed. Serve hot, warm, or at room temperature. 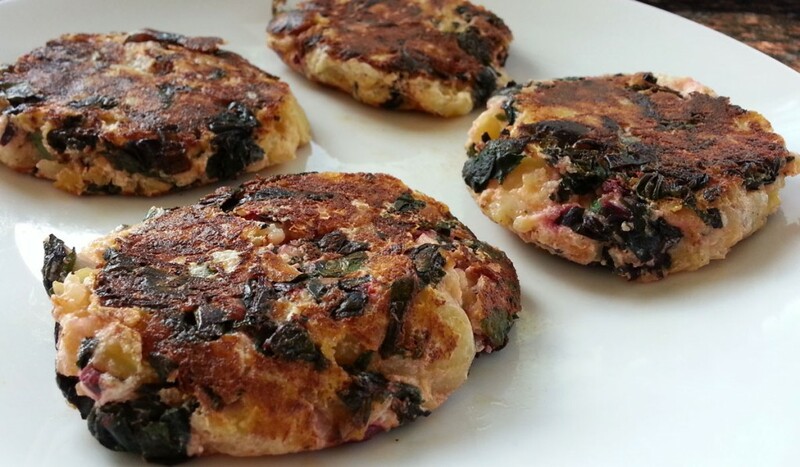 These wild rice fritters are amazing. 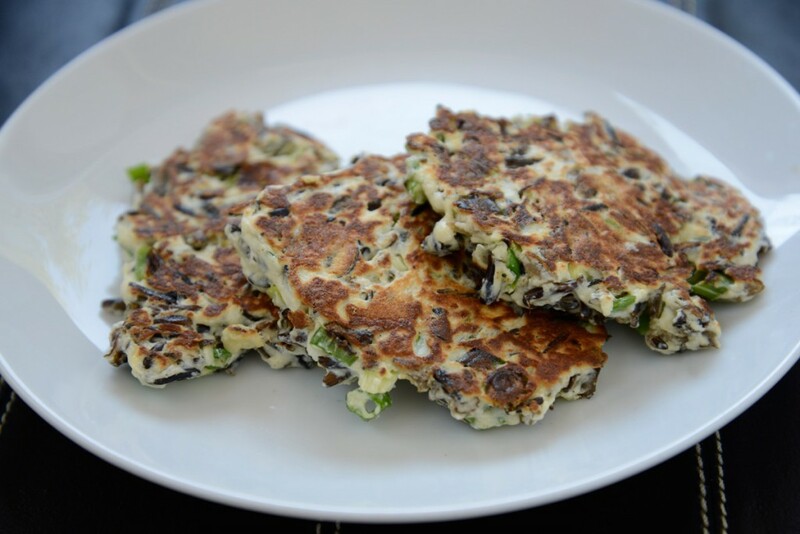 I had some leftover steamed wild rice last week from a recipe I was testing, and my husband suggested I make fritters with it. We talked about various options (adding some grated zucchini or sliced mushrooms, or incorporating shrimp), then landed on just the right combination to allow the sweetness of the rice to shine through: fresh, milky Ricotta, sliced scallions, and just enough egg and flour to bind everything. The fritters will stick to your spatula when you try to compress them unless you brush the spatula with olive oil first. Compressing the fritter mixture is key to success, as it exposes more of the batter to the hot pan, making for extra crispy-on-the-outside, soft-on-the-inside fritters. Don’t overcook the fritters or they will dry out: when they feel firm and are golden on both sides, they are ready. Turn these fritters into a rich main course by making them larger and topping them with a dollop of fresh tomato sauce and a poached egg. Note: If you’ve never steamed wild rice, it’s easy: rinse 1/2 cup of wild rice, then place in a heavy pot. Add 1 and 1/2 cups of cool water and 1/4 teaspoon of salt. Bring to a boil, uncovered. Then lower the heat to simmer, cover with a tight-fitting lid, and cook 45 minutes, or until the rice is swollen, some of the grains have unfurled, and the rice is tender to the bite. Let rest 10 minutes, covered, then enjoy as a side dish or in the recipe below. Some wild rice varieties require more water, others less; there is no way to know ahead but 3 cups water to 1 cup rice is usually enough. If the rice is still raw when all of the water has been absorbed, add more water and continue cooking until done; if there is leftover water in the pot when the rice is ready, drain off the excess water. 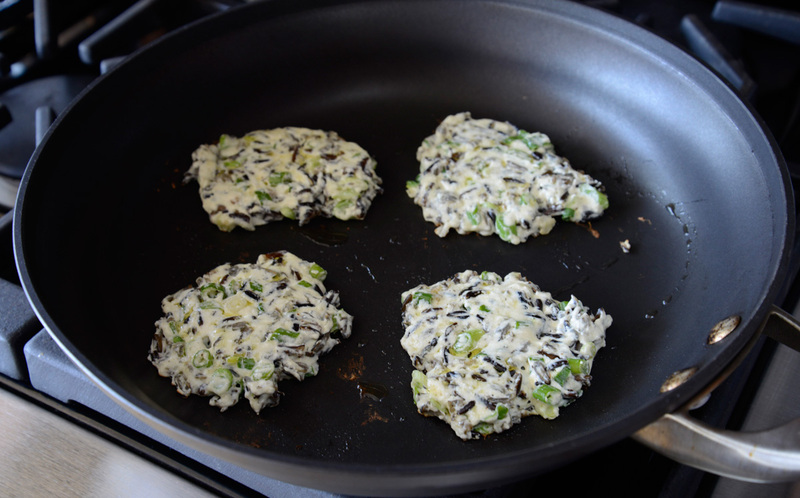 In a bowl, combine the cooked wild rice with the egg, scallions, Ricotta, salt pepper, and flour. Mix thoroughly. 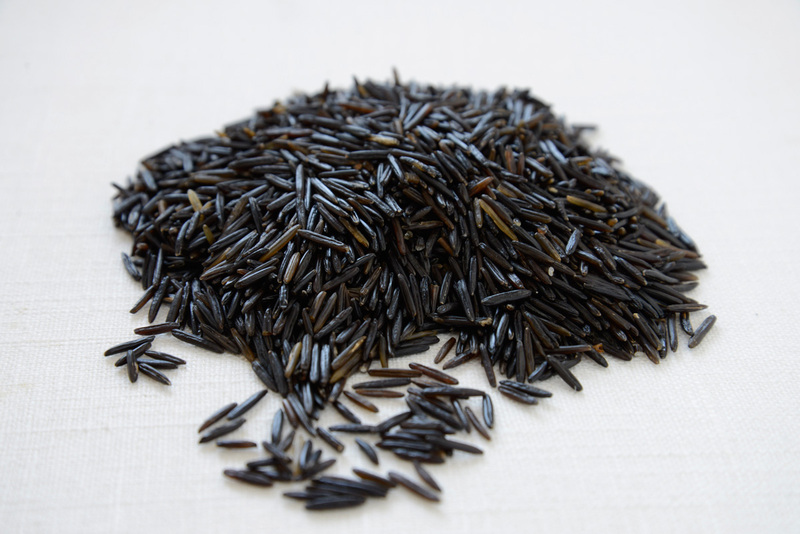 If the wild rice was not salted during cooking, add more salt to compensate; about 1/4 teaspoon more should do the trick. Heat a 12-inch nonstick skillet over medium-high heat and add 1 teaspoon of the olive oil. 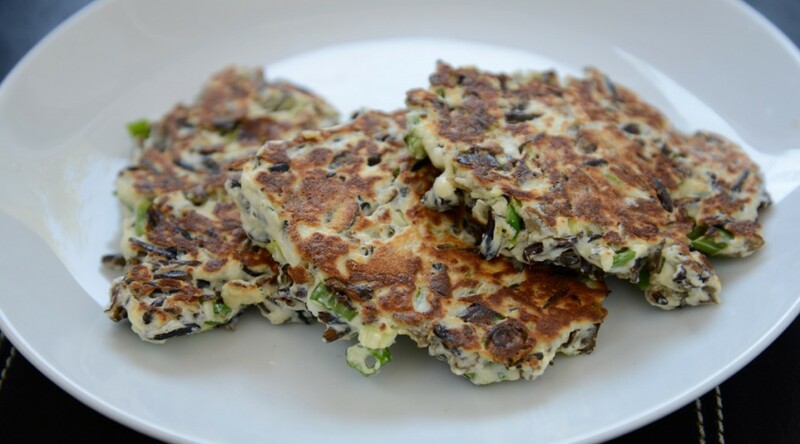 After 1 minute, spoon in half of the egg mixture in small mounds, making 4 fritters. Flatten with a spatula (I find it easier if you brush the spatula with olive oil to prevent sticking) and brush the tops with 1 teaspoon of the olive oil. Cook until golden on the bottom, about 3 minutes, then flip and cook until the other side is also golden and the fritters are set. Remove to a plate. Repeat with the remaining wild rice mixture and olive oil. Serve hot. The inspiration for this dish is an Afghani specialty called Aushak: thin pasta dough filled with spiced leeks, topped with a quick lamb sauce and dollops of minted yogurt. I wanted to reinterpret the flavors and play with them in an Italian way. The result: brightly flavored, light ravioli sauced with a robust, herbed lamb ragu enriched with a spoonful of Mascarpone. Quite the dish for company! The ravioli can be shaped up to 24 hours ahead and refrigerated, covered with a clean kitchen towel, or they can be frozen for up to 1 month; if you freeze the ravioli, do not defrost them before dropping them into the boiling water, but allow 1 extra minute for cooking. The ragu can be made up to 3 days ahead and refrigerated; warm it through before serving, while you boil the ravioli. Make the dough: Mix the flour and salt on a counter and shape into a mound. Make a well in the center and add the eggs to the well. Using your fingertips, work the flour into the eggs, then gather into a dough and knead by hand; add a little water if the dough is too dry or a little flour if it is too moist. Knead for 10 minutes, or until smooth, then shape into a ball, wrap in plastic, and let rest 30 minutes. Meanwhile, make the filling: Combine all the ingredients in a bowl and adjust the salt to taste if needed. Set aside. Assemble the ravioli: Cut the dough into 2 pieces. Working with 1 sheet at a time and keeping the other covered, roll out into a thin sheet using a pasta machine; the sheet should be nearly transparent after rolling. Be sure to lightly dust the sheet of pasta with flour every time you roll them through the pasta machine or it may stick or tear. Cut the sheet into 2-inch squares. Make sure the squares are on a lightly floured counter, or they will stick while you assemble the ravioli. Spoon a heaping teaspoon of filling on each square. Using your fingertip, rub a bit of cool water around the filling. Pick up each square and fold into a neat triangle, sealing the edges well. Place on a lightly floured parchment paper-lined tray. Continue with the remaining dough and filling. If you like, knead any dough trimmings with a touch of water to soften a bit and roll out again if you need additional dough for any leftover filling. Refrigerate the ravioli until needed, covered with a clean, dry towel. Make the Mascarpone sauce: Combine all the ingredients in a bowl; adjust the seasoning and set aside. When you are ready to serve, cook the ravioli: Bring 5 quarts of water to a boil. Add the salt and the ravioli. Cook until the ravioli are al dente, about 4 minutes, making sure the water does not boil too rapidly or the ravioli may fall apart. Drain gently, reserving 1 cup of the pasta cooking water to thin out the ragu if needed. Spoon half of the ragu onto a platter. Top with the ravioli. Spoon on the remaining ragu. Top with dollops of Mascarpone sauce and serve hot.